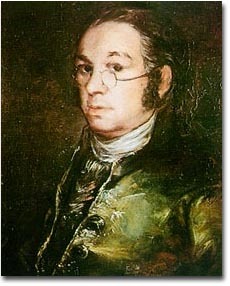 The remains of renowned Spanish artist Francisco de Goya are located in a tomb within a hermitage dedicated to Saint Anthony of Padua, called "La Ermita de San Antonio de la Florida". Goya died in exile in Bordeaux in 1828, and his mortal remains were finally put to rest in this small chapel. Due to possible confusion, his body was transported together with that of his son's father-in-law and Goya's close friend Martín Miguel de Goicoechea, and both tombs continue in this location. One curious though morbid fact is that Goya's head is missing, thought stolen sometime in the last century for phrenological studies. Goya had been commissioned to decorate the chapel, completing magnificent frescoes in just 120 days, and today this is a museum-pantheon that stands in memory of both the painter and the saint. A cult statue of Saint Anthony is to be found inside, while a replica of the chapel located on the opposite side is used for services and as the focus of a popular pilgrimage every June on the day celebrating the life of the saint. In the cupola of the old chapel Goya depicted Saint Anthony raising a murdered man to life, exonerating the man's father who had been wrongly accused of the crime. Swirling around him are "angelitas" or little angels who are the "majas" who appear in his paintings of local festivals. Although these works date from the 18th century, Goya's remains were only brought to this site in 1919. Close to a decade later in 1928 it was given the status of a museum, although it is only since 1993 that it's been fully open to the public. It has been declared a national monument since 1905 and is run with the help of the Real Academia de Bellas Artes de San Fernando.